Dental veneers can provide patients with a beautiful smile in a relatively short time without extensive dental work. A dental veneer is a thin, slightly translucent, wafer of pearly white porcelain that can be applied to a tooth or several teeth. Veneers are typically applied to the visible front teeth inorder to create a beautiful smile that does not yellow over time. Veneers are cosmetic only and cannot restore teeth that are dysfunctional or structurally damaged. Veneers are best when used to restore discolorations, superficial damage and can be matched to the shape, color, and alignment that provides the most complementary smile. Time to complete - Dr. Clausen usually requires two dental visits to place dental veneers and takes between two to four weeks to complete the process. 1st procedure visit - Dr. Clausen a dental mold of the teeth to be veneered. 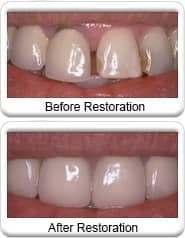 Dr. Clausen will recommend the shade of white that best blends with the other visible front teeth and will create a natural looking beautiful smile. The mold is sent to the lab for fabrication of your veneers. If a low-preparation option is needed, the teeth to be veneered are abraded to provide a better fit and bond to the tooth. Dr. Clausen will create temporary resin veneers for the prepared teeth. The resin veneer looks like the permanent veneers but does not offer the durability of the ceramic. 2nd visit - Dr. Clausen, removes the temporary veneers, cleans the teeth being veneered, and then he bonds the veneer to the tooth. The process is painless. You will leave with a beautiful permanent smile. Dental veneering is a minimally invasive procedure with very few associated problems. Porcelain veneers are strong and durable; however, they may need to be replaced at some point. The procedure is irreversible; therefore once placed, veneers must remain intact and should be replaced when needed. Our veneers are designed to withstand normal dental forces better than ultra-thin dental veneers. Veneers can last and look great for fifteen to twenty years, with good care, even longer. We find that individual results vary greatly depending on the habits of the patient. Bitting hard foods like ribs, ice chewing, and nail biting can damage the veneer over time and reduce the usable life. Veneer cost is very patient specific. The ceramic veneer is only part of the expense. The number of teeth and any required supporting dental work required needs to be considered. Dr. Clausen will provide you with a cost estimate after examining your teeth.